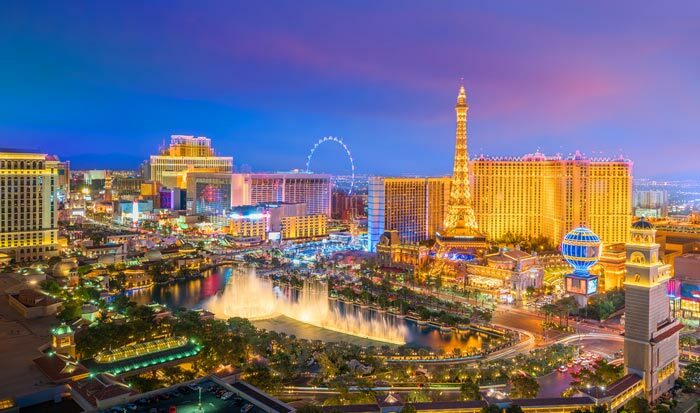 Las Vegas may be known for its casinos and resort-style mega hotels, but, as you’ll see from our list of the top 10 things to do in Las Vegas, there’s far more to this city than meets the eye! Known as the Entertainment Capital of the World, there is always something going on in Las Vegas, whatever the time of year, or the time of day or night, and it’s not just a place for adults either. Vegas has grown into quite the family-friendly destination with ample attractions that will appeal to visitors of all ages. Known as Mr Las Vegas, Wayne Newton has been entertaining visitors since the 1960s and is still going strong today. 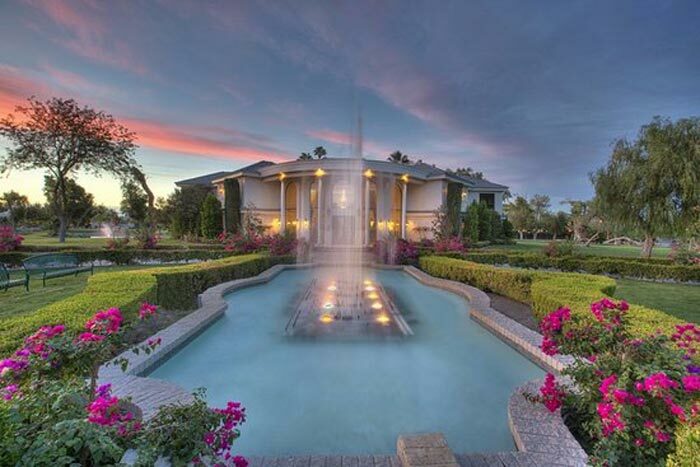 You may not have heard his name, but his beautiful home, Casa de Shenandoah, is one of the top Las Vegas attractions and it’s open for tours. Take a guided tour around his opulent home and gardens for a glimpse into his life and the lives of many of his celebrity friends. See his classic car collection, his personal jet, and a priceless collection of memorabilia. You don’t have to be a fan of organized crime to enjoy this museum! The Mob Museum should be on everyone’s list of what to do in Las Vegas because it’s a great museum. Perfect for kids as well, although probably not the really little ones, this attraction in downtown Las Vegas shows you the battle between organized crime and law enforcement, featuring true stories and real artifacts, as well as interactive exhibits. Over 1,000 artifacts are spread across the 3 storeys of this building, and be sure to visit the basement for a look at a speakeasy and to sample some moonshine! 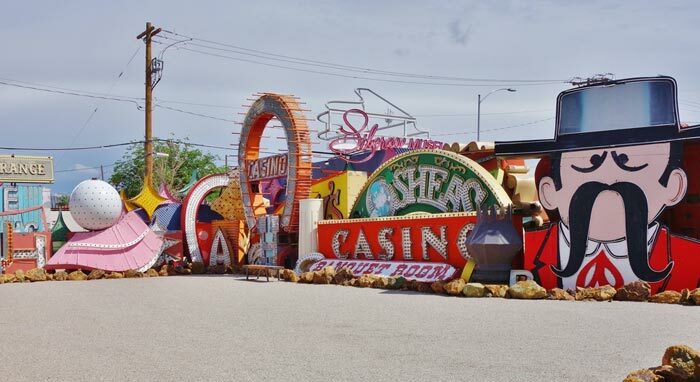 Another fascinating museum for Las Vegas is the Neon Museum, also known as the Boneyard. Have you ever wondered what happens to all the old neon signs that are taken down when casinos and other businesses are closed or renovated? Well, they end up here, on the Boneyard! This very popular Las Vegas attraction is only accessible on a one hour guided tour, and tours get booked up fast, especially the night ones when some of the old signs are illuminated. 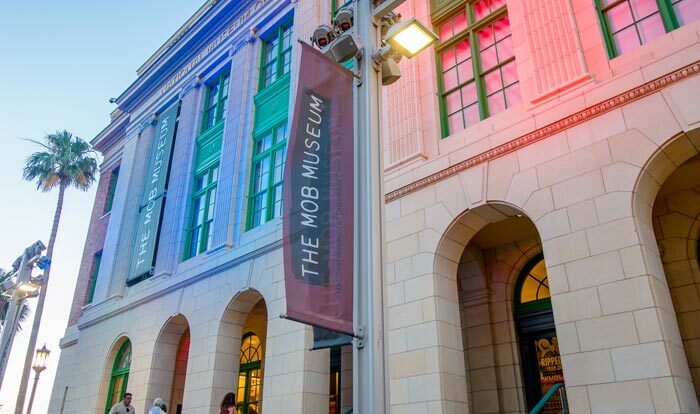 Combo tickets with the Mob Museum are also available. It seems that everything is larger than life in Las Vegas, and the food is no exception! One of the best ways to dine out in Vegas is by choosing an all you can eat buffet. These are great value for money for the whole family and the quality of the food is excellent too. 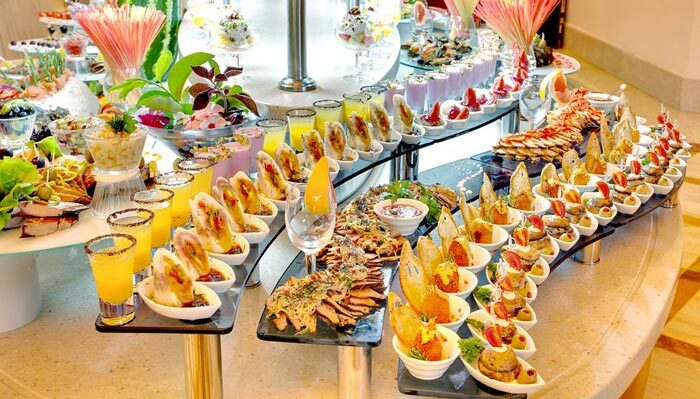 There is so much choice in these buffets that there will always be items to satisfy even the fussiest of eaters. Available in just about all of the major casino hotels, the buffets do vary in price. Expect to pay more in places like Bellagio, but for the higher price, the food is even better. And, as a bonus, with most buffets, soft drinks are included within the price, as well as desserts. As the Entertainment Capital of the World, no list of what to do in Las Vegas would be complete without live shows and performances. It doesn’t matter what time of year it is, there will always be countless shows to choose from whether you enjoy watching a band in concert, a magic show, a comedy act, a variety show, or an amazing Cirque du Soleil performance, Las Vegas has them all! Shop around for the best prices as there are always discounts available. 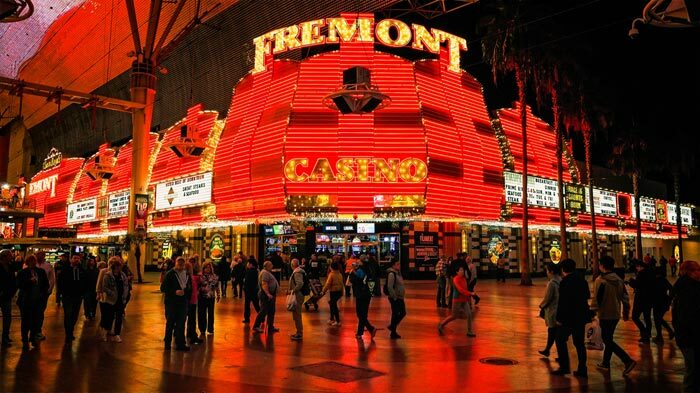 Before the famous “Strip” was even dreamt up, Fremont Street, in downtown Las Vegas, was the heart of Sin City. Today, a 5-block stretch of this street has been covered and closed to traffic to create the Fremont Street Experience. By day, you can explore some of the city’s older casinos such as the Golden Nugget (home to the world’s largest gold nugget), while by night this is a premier nightlife and entertainment spot with nightly light and sound shows and free entertainment on several different stages. There are also places to eat and drink, and extra attractions such as the world’s largest slot machine and a zip-line. No wonder this is one of the top things to do in Las Vegas! 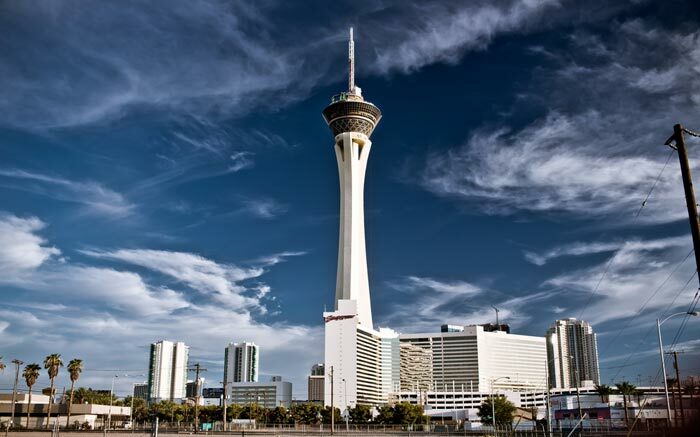 The tallest free-standing observation tower in the US is the perfect place from which to get an amazing view of Las Vegas! And, it’s not just an observation tower – Stratosphere features some extremely thrilling thrill rides that are not for the faint-hearted. But, you can just come up here to enjoy the views, or a meal in the restaurant. A great time of day to visit is around dusk because you can watch the sun go down across the desert and the city light up. 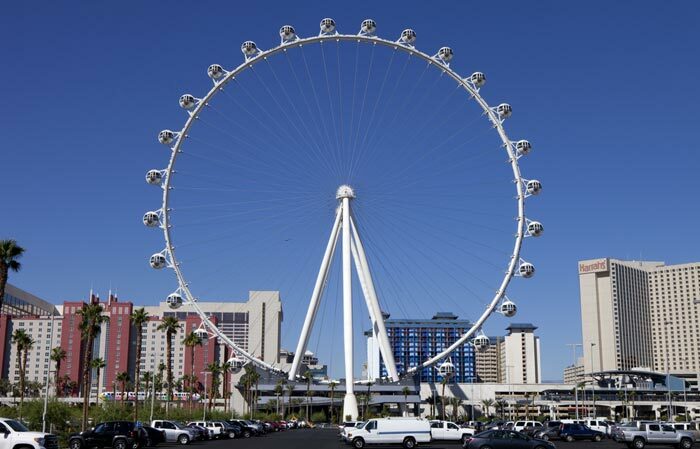 The world’s tallest Ferris wheel is one of the top Las Vegas attractions. 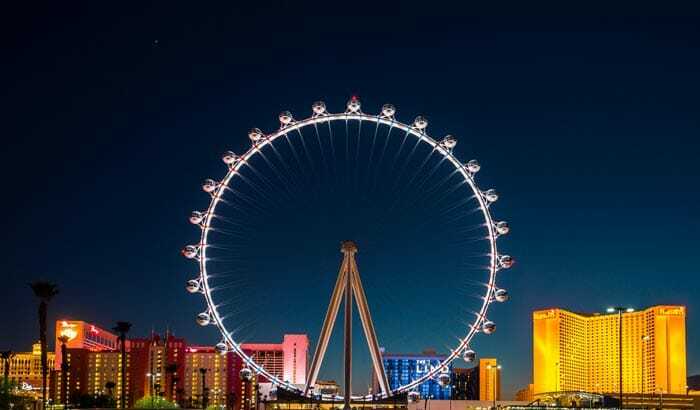 Opened in 2014, High Roller eclipsed both the London Eye and the Singapore Flyer, standing 167.6 meters (550 feet) high. It stands just off the Strip but is positioned parallel to the street to give views both up and down the Strip and over most of Las Vegas from its pods, which take a half hour to do a full rotation. High Roller is linked to the Strip via The Linq Promenade, a pedestrian-only mall that features restaurants, shops and other attractions. While Las Vegas itself is busy and a little overwhelming at times, head just a short distance out from the city and you’ll enter a different world. 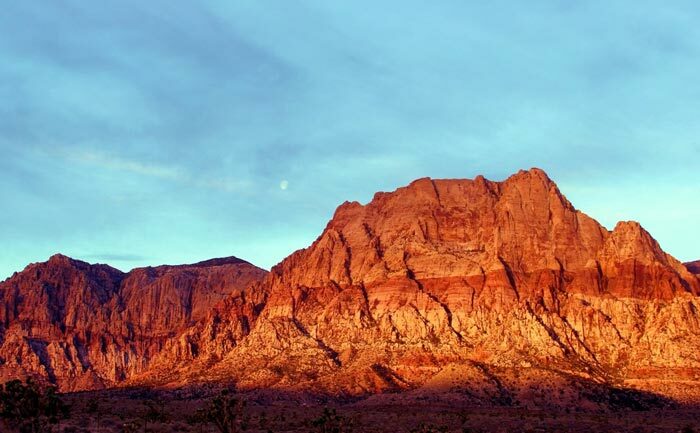 Red Rock Canyon National Conservation Area is just about 24 kilometers (15 miles) from the city and is always highly recommended on lists of what to do in Las Vegas. 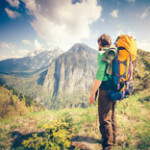 Drive the 21 km (13 miles) loop road to get a taste for the striking scenery, or head off the road and enjoy the many hiking trails or rock climbing opportunities. The large red rick formations are really quite beautiful and unexpected. 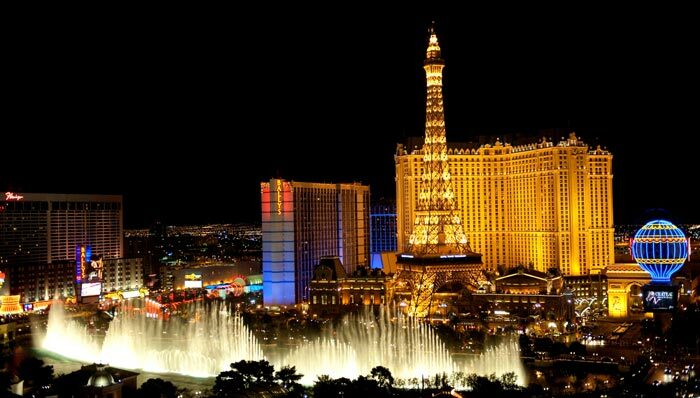 The Strip is our top thing to do in Las Vegas. It’s many different attractions in one and it’s a place that has to be seen to be believed! Full of vast casino hotels that are attractions in themselves, the Strip (aka Las Vegas Boulevard) runs about 7 kilometers (4 miles) in length. You won’t be able to fit everything in during your visit, but be sure to check out the Fountains of Bellagio and the Botanical Gardens, walk around inside Luxor, go on the roller coaster at New York New York, a gondola ride at The Venetian, see the Strip from the Eiffel Tower, catch a free circus performance at Circus Circus, and stay for the indoor amusement park rides, see a volcano erupt at The Mirage, and view the Shark Reef Aquarium at Mandalay Bay. And, drive along the Strip after dark!